I don’t know about you, but I absolutely love noodles, especially egg noodles. They are so easy and quick to prepare, plus, there is no boiling needed here. As for the taste, in my opinion, they are a bit lighter than classic pasta, like spaghetti. Don’t get me wrong, I love pasta /I can eat pasta all day long, every day /, but for me, pasta is usually a rich and heavy dish. When I make pasta I keep it simple in flavors, but sauces, as simple as they can be, often involve cream and lots of cheese. When making egg noodles, you don’t need heavy sauces or cheese, all you need is good amount of veggies and good quality soy sauce (plus some other Asian sauces if you have on hands). A few days ago, I received (thank you, BioMarketBalev) a selection of Asian style organic products of the Clearspring brand, some of which I used in this recipe. 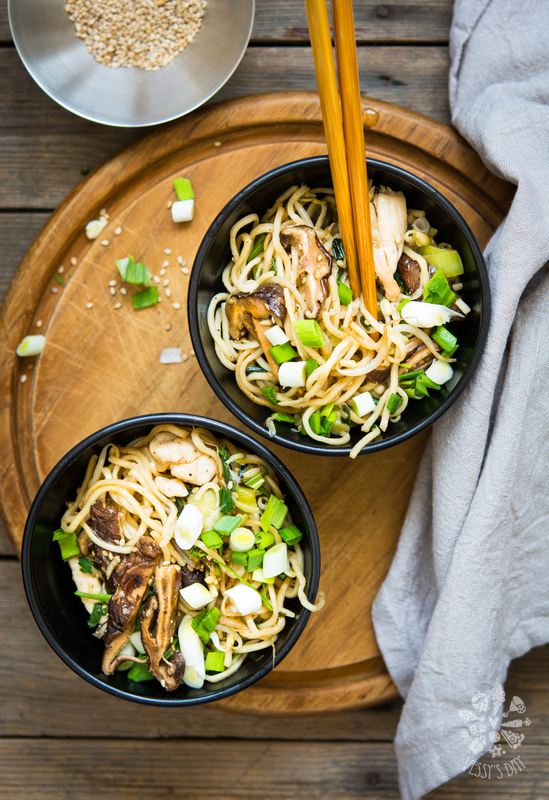 Shiitake mushrooms were unbelievable delicious and I believe that the one thing you can not replace in this recipe are the shiitake – they give this amazing flavor to the meal. Believe me, it’s really good, so don’t skip them or use any other mushrooms! I have a few extra gems left, like organic silky tofu, wakame, sushi supplies, so stay tuned for the upcoming recipes! 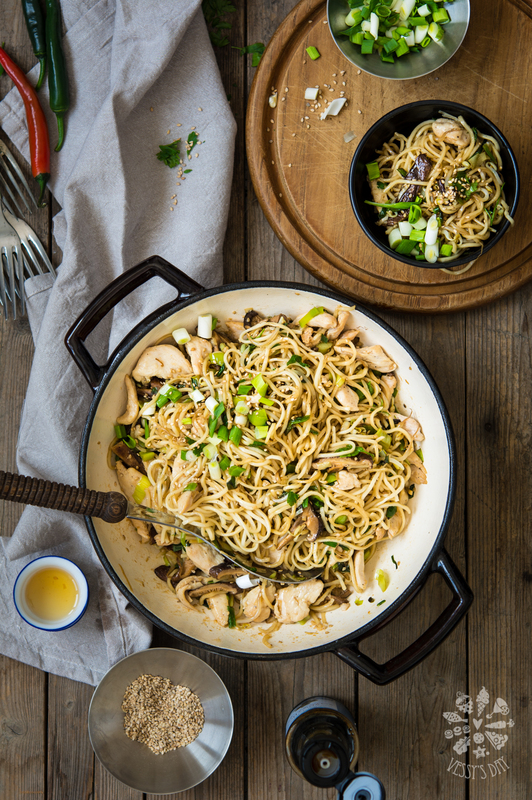 Anyway, back to this one….there are millions of flavors and recipes for chow mein. Often, I throw in whatever veggies I have left in the fridge, that’s the beauty of this dish. So, in case you have some other vegetables you want to add to the recipe, just feel free. As of preparation, most important thing to remember here is that egg noodles do not need boiling, you just have to cover them with hot water and let them sit for about 15 min and they are ready. Place shiitake mushrooms in a large bowl and cover with boiling water. Let them sit for about 15 minutes or until soft. Drain and cut into small pieces. Discard any tough parts of the mushrooms. Set aside. In another large bowl add noodles and cover with boiling water. Let them sit for about 15 minutes, then drain and wash with cold water to stop the cooking. Add a drop or two of sesame oil and stir. Set aside. In the meantime prepare the chicken: In a large saucepan, heat a little bit of olive oil and add the chicken, cook until golden brown, then add a tablespoon of soy sauce and cook until soy sauce evaporates and chicken is a bit caramelized. Transfer chicken to a bowl, season with salt and pepper, drizzle a little bit of sesame oil and stir. Set aside. In the same saucepan heat another tablespoon or two of olive oil and add shiitake, onions, leeks, garlic and bean sprouts. Cook for a few minutes, then add a tablespoon of soy sauce. Cook for another minute. Sprinkle some sesame oil, sesame seeds, season with salt and pepper and stir. Add chicken and noodles and give it a good stir to combine and noodles warm up. I definitely do love noodles too though I haven’t made chow mein before. It’s one of those dishes that I love eating and ordering out. Definitely inspired to make it soon. Thanks! Thanks Thalia! You should try these! It’s a great family friendly recipe and so easy to prepare! Hope you like it! Enjoy your weekend! This looks amazing. I’m a huge chow mein fan and AMEN to the throwing in whatever you have in the fridge. Thanks so much Jessie! 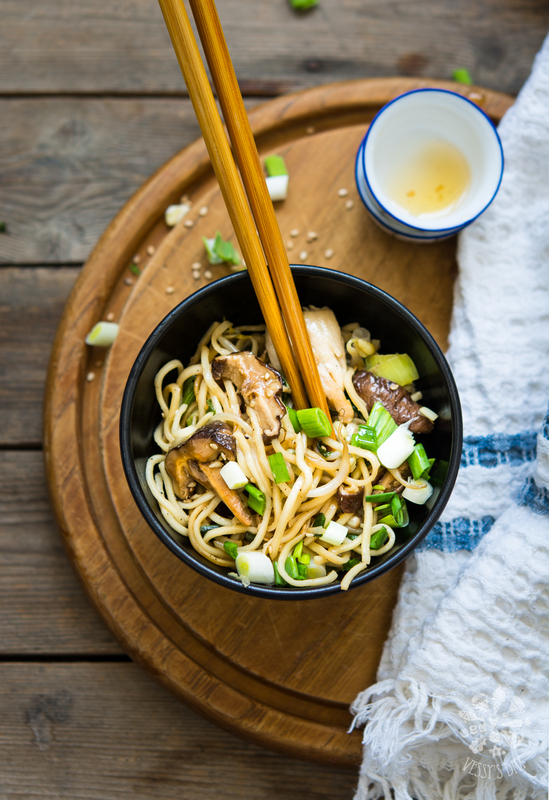 You should try a chow mein at home, it is actually quite an easy recipe and sooooo, soooo delicious! I am drooling right now, thinking about it .